‘A quidnunc is a gossip, someone who is constantly asking ‘What now?’ ‘Quidnunc’ is a poem in which four individuals are haunted in different ways by what they have not forgotten. And Quidnunc is a collection in which, whether recent or distant, personal or cultural, the past is keenly felt. This book is available to purchase from Amazon and Carcanet Press. 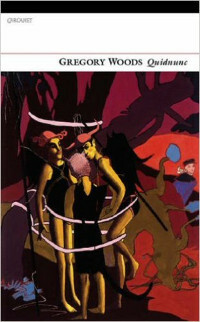 To make comical history as serious as it is absurd in two sequences—‘The Newstead Fandango’, where the story of Lord Byron is filtered through Ulysses’ home run, and ‘Sir Osbert’s Complaint’, which puts the Sitwell family in the pillory while retaining sympathy for Osbert’s lonely end—this could only be Gregory Woods in action, the poet with the sharpest technique for social verse in Britain today. He lets off fireworks through the official groves of English literature. The poems of Gregory Woods have never failed to impress me. When a book like Quidnunc, his fourth collection from Carcanet, makes its appearance, it makes me seriously wonder what the selectors and pre-selectors for prestigious awards are up to. Why isn’t Gregory Woods’ name up there? For a start there are few poets around who can rival him technically … Not only does he impress with his gift for sustaining poems over some length, he can dazzle with spectacular rhyming … This is a solid and hugely readable collection with many more things to admire than just the technical accomplishments … Woods is a poet whose thinking is razor-sharp, his wit highly inventive, his sense of history acute, his narratives finely sculpted, his feelings deeply sourced. In this, his fourth, volume, Woods’s dramatic range and technical ambition are greater than ever … His poetry has never been more alive. This new collection, his fourth, is his best so far, which, given how accomplished were the previous three, I intend as high praise … Woods is, indeed, a quite astonishingly gifted formalist. You feel that there’s no kind of verse he couldn’t use, adapt, subvert, play games with … ‘The Newstead Fandango’ and ‘Sir Osbert’s Complaint’ alone ought to be enough to have won Quidnunc any poetry prize going. And there are other poems equally deserving of note in this brilliantly assured collection. In fact, there’s almost nothing that falls below the level of good, and several poems that are quite simply outstanding … When I think of the dross that is regularly published, noticed, praised, rewarded, and then consider that for the most part Woods goes without recognition, I’m not so much aghast as enraged at the (still largely London) cabal that decides poetic worth in England.